For someone who only this week got up on his high horse and advocated for "peer review" not "pal review", Anthony sure knows how to pick 'em. All the above are utter nutters and if any of them tried to put together a "hypothesis" about climate and submit it to a journal, it would land in the waste paper bin or junk mail folder within a split second of the electrons hitting the journal editor's screen. I won't bother with his long section on the various scientific methods. I'll write instead about Vincent's strange notions of climate science. Climate Change Science claims that any change in the climate is caused by human emissions of minor trace (“greenhouse”) gases in the atmosphere, notably carbon dioxide. The theory is in complete contrast to the assumptions behind the climate models used by weather forecasters. How many "wrongs" can you count in those two sentences? The first one is plain silly. You just need to look at a basic description of climate to know that there are any number of things that will bring about changes in climate - at the local as well as global level. Anything from a slight shift in the orientation of earth to the sun to a volcanic eruption on the surface of Earth - and lots of other things besides - like changes in ocean circulation. Climate modeling is also fundamentally different from weather forecasting. Weather concerns an initial value problem: Given today's situation, what will tomorrow bring? Weather is chaotic; imperceptible differences in the initial state of the atmosphere lead to radically different conditions in a week or so. Climate is instead a boundary value problem — a statistical description of the mean state and variability of a system, not an individual path through phase space. Current climate models yield stable and nonchaotic climates, which implies that questions regarding the sensitivity of climate to, say, an increase in greenhouse gases are well posed and can be justifiably asked of the models. Conceivably, though, as more components — complicated biological systems and fully dynamic ice-sheets, for example — are incorporated, the range of possible feedbacks will increase, and chaotic climates might ensue. Vincent goes on to describe what he thinks "climate change science" assumes. I'll take them in turn. Vincent's notion is in italics - I guess you'll be able to tell that much. The climate is unchanged without the effects of greenhouse gases - Not true. The science of climate not only assumes that different forces act on climate, to a large extent these days it can distinguish which forces are acting when. For example, satellites measure total solar irradiance at the top of the atmosphere to determine how much the sun is affecting climate. Even the effect of changes as small as the eleven year solar cycle can be measured. Scientists can also work out how volcanic eruptions affect climate. And they can work out how changes to the earth's surface, like changing snow, ice and vegetation, can affect reflection of short wave radiation and long wave radiation from the surface. They can measure how changes in ocean circulation can bring about changes in atmospheric circulation - and work out the impact that has on climate. Climate science is pretty good when you think about it. Whereas Vincent Gray is a know-nothing denier. The earth is flat - I think that most scientists realise that Earth isn't flat. Perhaps some of Vincent Gray's chemistry colleagues believed Earth was flat, but climate scientists are cluey about such matters. The Sun shines day and night with the same intensity - Actually, this is about right. There are slight variations over an eleven year cycle. But the sun does shine all the time at roughly the same intensity. It hasn't stopped shining once since Earth was formed AFAIK. Vincent probably thinks that the sun goes out altogether at night time. He'd be wrong. It doesn't. It's just that the bit of Earth that he's on doesn't always face the sun. Who'd a thunk it? Energy exchanges are almost all by radiation. Well I don't know what world Vincent inhabits but it's not the world of climate science and it's not WUWT either. He's not seen this chart. HotWhopper readers have seen it more than once in the past week. Even WUWT-ers have seen it or one similar. I guess Vincent doesn't read WUWT. 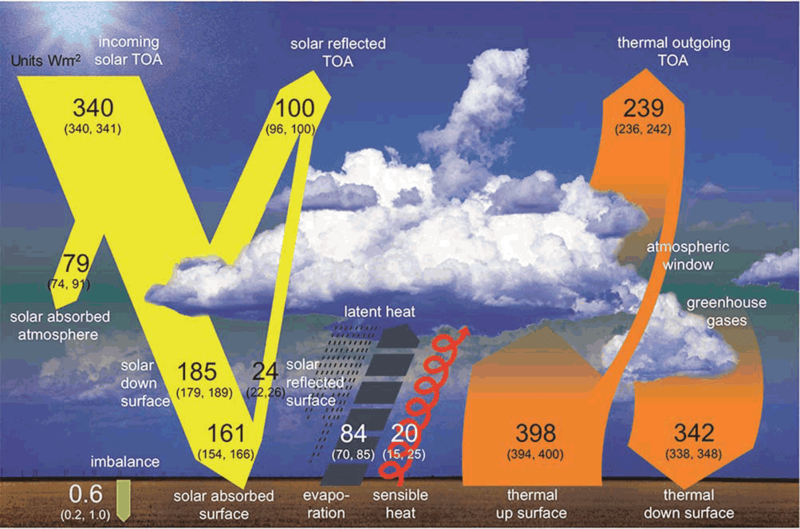 Look at the chart and see all the different ways energy is exchanged. And that's just the surface and the top and bottom of the atmosphere. In addition to that there are exchanges of energy within the ocean that affect climate. Let's see - radiation, convection, conduction, evaporation and condensation - all sorts of energy exchanges. Energy exchanges are “balanced”. - I get the feeling that Vincent Gray doesn't accept the notion of the conservation of energy or the laws of thermodynamics. Climate scientists do. Energy exchanges are instantaneous. - I have no idea what is going on in that head of Vincent Gray's? If energy is exchanged it's exchanged in that same instant as it's exchanged. Can someone help me out here? Perhaps he is talking about kinetic and potential energy. No work is done on the system. - again - I have no idea what Vincent Gray is referring to here. Is he talking about forces acting on earth from space or work within the system like, say, wind or ocean currents? “Natural” climate properties are not only merely “variable” but are also negligible. This is an odd one, too. What does he mean by "climate properties"? What does he mean by "natural"? Only then can we consider what is or is not negligible. There would be lots of little things happening within the earth system that are not "negligible" but are "natural". For example, the microphysics of clouds operates at a much smaller dimension than your typical climate model, but it's not negligible. If it were then climate scientists wouldn't bother factoring these effects in - but they do. There is no reason in principle why such an unlikely theory could not be correct. Planck’s Quantum theory was an example of a theory which was implausible and completely at odds with existing theories of energy transfer, which Planck himself could hardly believe. It has succeeded because it has been comprehensively validated. I'm not surprised he regards his view of "climate change science" as being unlikely. Climate scientists would laugh him out of the room if he put his notions to them. Projections should be validated against future observations! Vincent has written a lot more than the above, but I'll not waste my time on most of it for reasons that should by now be obvious. I'll leave you with him bemoaning one aspect of climate science and let you ponder his complaint. Climate Change models do not make forecasts but merely projections which depend on the plausibility of the model parameters and of the futures scenario details. These projections have never been validated by comparison with a full range of future observations. Huh? We wouldn't need models if we had future observations, now, would we! To be biased is to be. And to be human is to err. Yet bias and error do no harm if a free play of conjectures and open testing, maybe to destruction, of our conjectures is welcomed and facilitated. A bigot is not someone forthright and wrong but someone who, even if correct, will not seek criticism and counter-argument and dismisses it when it is provided. When I started looking into CAGW about 10 years ago, what Dr. Grey has written was blindingly obvious to me. The way I put it was that you cannot do controlled experiments on the earth’s atmosphere. This must have been obvious to people with names like Houghton and Watson, yet the FAR was still published, making it little more than a hoax. But even in 2013 we have a scientist of the calibre of Lord Reese going out in public and telling “porkies” about CAGW. The man's ignorance is shown by this quote: "Scientific observations have to be repeatable." Ideally, science would be repeatable, but a supernova only explodes once, an earthquake only happens once, volcanoes only erupt once at a time. Much of science, as he must know had he given it a moment's thought, is based on one off observations. Perhaps Dr. Gray is an in vitro, or tabletop, chemist, and not familiar with the larger campus? That would explain why he doesn't have to worry about lengthier processes like energy transfer, or the shape of planets. Science begins when an observation prompts someone to wonder WTF that's all about. The denier version starts with future observations of no significant AGW and tries to explain them. Science it ain't. I doubt old Vincent has many future observations left in him. WUWT certainly knows how to pick 'em. Grey is a founding member of the New Zealand Climate Science Coalition, who infamously took on the National Institute of Water and Atmospheric Research (with funding from Heartland) and lost. They also requested that a Royal Commission be held on climate change. Flat earth nutters is all they are. They are getting more and more desperate as 'mother nature' is showing them up. The common theme among deniers is that they have a serious case of ABCD (Anything But Carbon Dioxide), but when asked to give an alternative model for the warming, they perform their trick of misdirection as they plummet into a tirade of conspiracy ideation or 'scientists know nuffin'. They contend 'It's all natural', but when asked what is naturally causing the warming, they again plummet into a tirade of conspiracy ideation or 'scientists know 'nuffin'. Please don't take this the wrong way as I am a regular reader of this site who is firmly in the pro-science/anti-nutter camp, but I thought your questioning of the term "climate change science" was a little bit of an own goal given that its use is established at least by John Cook's book "Climate Change Science: A Modern Synthesis". In general though, keep up the great work you are doing. Isn't that odd, Anonymous. I've never come across the term before that I recall. Since your comment I googled the term and it's everywhere. I still think it's a very silly term and I wish it hadn't caught on. The science of climate doesn't need the word "change" in it. It's redundant. I've no problem with the term "climate change" - but climate change science? That's just silly. The science of climate change is "climate change science." Sorry Sou. You are just wrong.